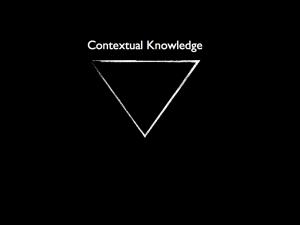 Bifurcated Concentration of Knowledge Doesn’t Serve - esther derby associates, inc.
Contextual knowledge is concentrated at the top of the organization. We’ve long lived with the assumption that the people at the top of the organizations are the ones who understand the business. They understand the market, the product, the customers. They hold the financial information about how the company makes money and the current financial status. Since they hold this info, they also know what the company should do—on a strategic and tactical level. One assumption behind this model is that the brains are at the top of the organization and the brawn is at the bottom. 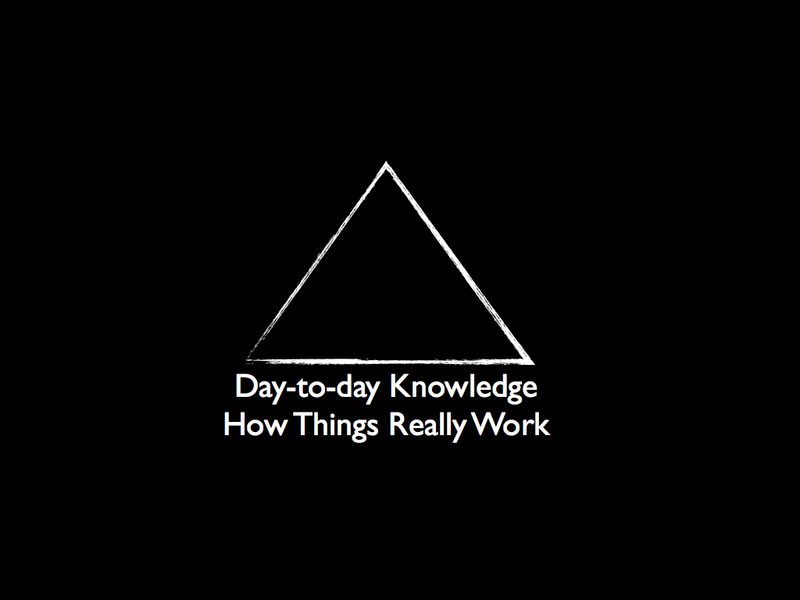 Knowledge flows down, but mostly on a “need to know” basis. So it filters down as a trickle, not a torrent. At the same time, the hierarchy acts a filter from the bottom up. 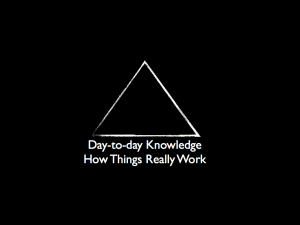 Day-to-day knowledge about how things really work, who to talk to when you want to get something done, how to work the (doesn’t work as defined) process, work arounds, greasing the skids, what the status really is and other useful stuff is concentrated at the bottom of the organization. Implementation knowledge--how things really work and how to get things done--is concentrated a the bottom of the organization. The higher in the organization, the more the day-to-day reality of business is abstracted to numbers. And because the people at lower levels in the hierarchy don’t want to displease people at higher levels, they tend to minimize bad news—so the picture becomes rosier with each level it ascends. 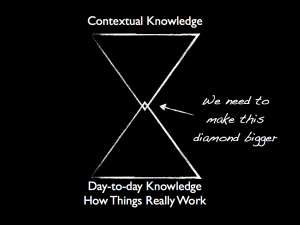 One can argue that this model of knowledge concentration has worked. There are many companies that started this way, and they are still around. But I think the days when it served us well are over. It doesn’t meet the needs of the our times or our industry. For one thing, we aren’t pouring ingots. We do knowledge work. We need to know about the context, customers, and cash flow in order to make the right products. We live in a time of fast change. The competitive environment and customer preferences can change on a dime. This bifurcated concentration of knowledge does not serve us. It makes companies slow as requests for approval work their way up the chain. Worse, it makes companies stupid. Think about it. How many times has a decision from top management looked silly, misguided, or malicious given the realities of implementation? How many times has management countermanded a decision made close to the work because the people who made the decision were missing some piece of information about market context, customer needs, or how cash comes in the company door? If we want our companies to be smarter and faster, we need to increase the overlap of contextual and implementation knowledge. 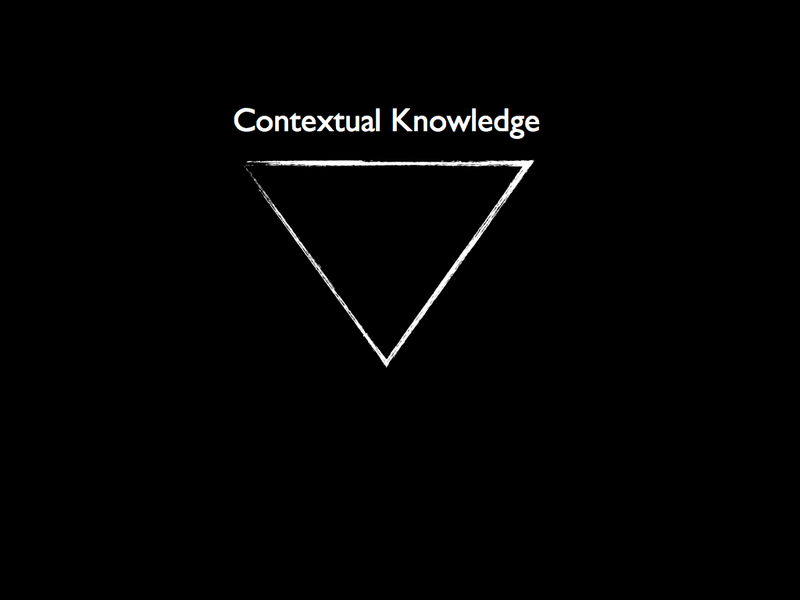 If we want our companies to succeed, we need to make the over-lap between contextual knowledge and implementation knowledge bigger. Terrific blog Esther — I’m so pleased I found it! As you diagram implies, companies that suffer from extreme bifurcations are in danger of collapsing over themselves. All organizations, actually outgrow their structures since the human mindsets that gave rise to those structures were implemented at a particular point in time to face particular challenges. Once these structures are built it take them longer to evolve than facts on the ground (e.g., new governmental financial regulations, a big oil disaster, etc.). Leaders are responsible, with the support of their stakeholders, to innovate so that the organization can effectively adapt to new realities. 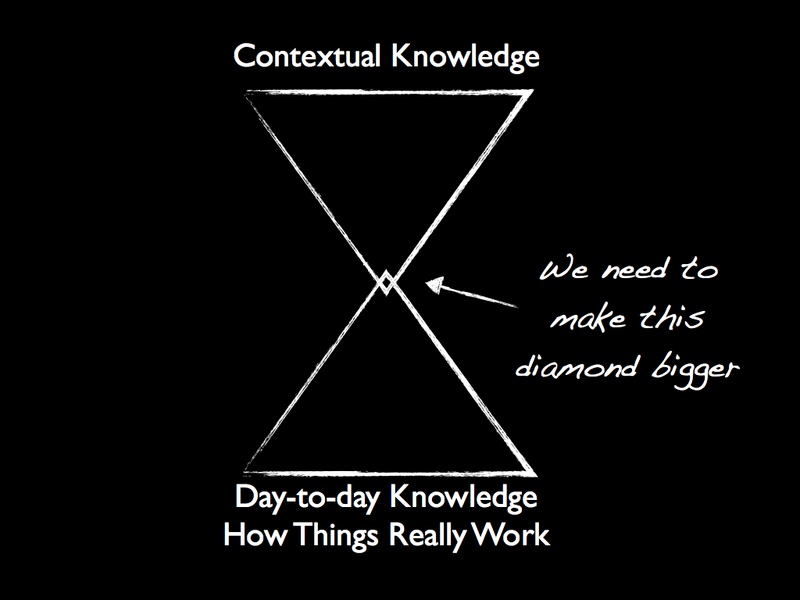 And this requires, as you so eloquently put, making the diamond bigger! You and your readers may be interested in my blog where I recently discussed how to leverage history when leading change. I believes it offers a complimentary POV to your piece here. Interesting perspective. If it is not the brain that makes meaning of the strings hanging loose from a shoe, what is it? I do think that people on the front lines often have more ability to fix things than they realize. But they may make poor decisions if they don’t understand the business and the customers, they may “fix” things in a way that harms over all results. And if CEOs have no idea what it takes to produce products, they can’t make good decisions either.